Avail of a very special fare on your second ticket. Fare must be booked during the promo period only. No waitlist allowed. The second ticket can only be availed once for every ticket purchased. The second ticket must be ticketed at any PAL ticket office on or before 11 January 2012 and passenger is required to purchase the first ticket. The second ticket may be issued on a different destination on the same or lower class of service but for the same passenger(s). Passengers booked under one reservation record must travel together on both travel periods. Infant without seat – 15% of the accompanying fare for the 1st ticket only. Infant discount not applicable on the second ticket. Applicable government taxes, fees and surcharges for all tickets shall be collected. 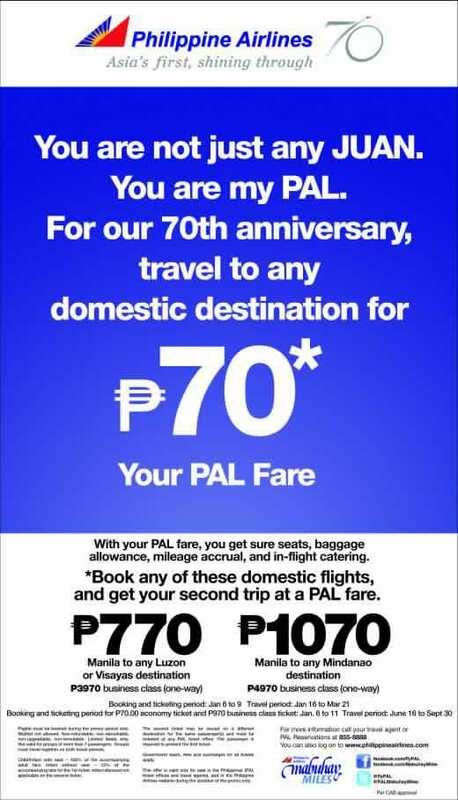 Click here to book via Philippine Airlines now!